It seems that this year instead of the “Do Us A Flavor” contest Lays is doing the “Passport to Flavor” contest, with four new limited edition global flavored potato chips. I guess they got tired of having to sort through entries like toenail fungus and unicorn meat and decided to send people away. I’m not really all that interested in the contest itself, but some of the global inspired flavors have caught my attention. First I want to take a minute to ask: where is our royalty check for the Greek Tzatziki flavor? We suggested practically the same exact flavor (a potato chip where the main flavor is tzatziki sauce) in the Do Us A Flavor competition two years ago. We didn’t even make it to the finals, and now here it is as a flavor. Hmmm. Anyway. The other flavors are Chinese Szechuan Chicken, Indian Tikka Masala, and Brazilian Picanha. The one that really caught my attention was the Indian Tikka Masala. A treat that Erik and I both enjoy when we go to the Indian buffet is dipping the vegetable (including potato) pakora in the tikka masala sauce. It’s really yummy. So I was intrigued. I had the feeling that this could be a good chip. Erik was much more skeptical however, that they could really capture the essence of tikka in a potato chip. To be fair, I still make fun of them, but holy hell I cannot shake this craving. If I didn’t know any better I’d say I’m pregnant. (If Meg and I didn’t hate children. Oh and also, there’s the me being a dude part). 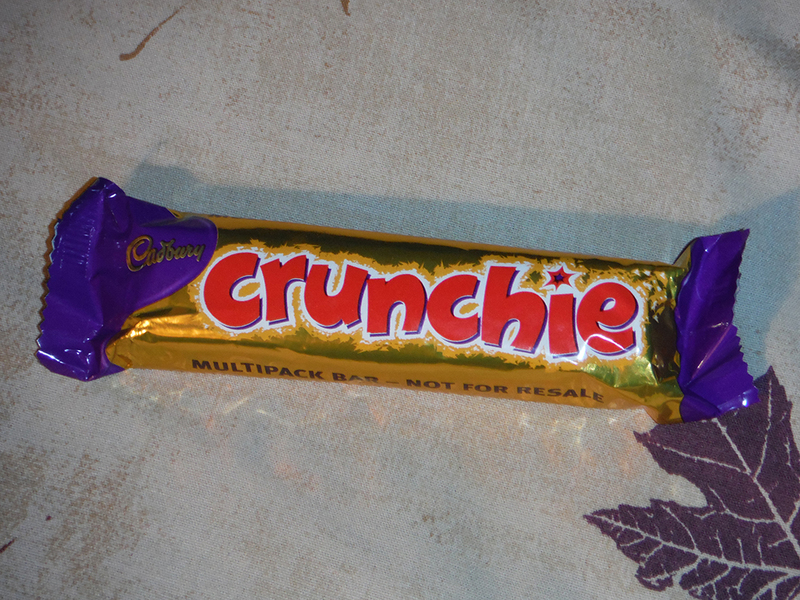 Lo and behold, we happened upon a fun, little tea shop recently that had Crunchie Bars in stock. I’ve vaguely heard of them in passing, but never actually ate one since they’re not usually sold in the Americas. And man, with top-tier chocolate companies like Cadbury being over there, Europe is freaking spoilllllled. Shhh… don’t tell anyone this wasn’t for resale. HONEST. IT’S NOT OUR FAULT. I’m mixing things up a little bit with this Test the Recipe post because I didn’t find it in a book; I found it in my grandma’s recipe box. As such, I don’t know the actual date on it, but considering the recipe is my great-grandmother’s I think it’s fairly safe to assume that the recipe falls within the time frame I established. I think a lot of the Christmas cookies my mom makes use my great-grandma’s recipes, but she doesn’t usually make peanut butter cookies, so I wanted to give these a try. I really enjoy peanut butter, and cookies are great, so I was excited to have some peanut butter cookies to eat. I’m sure my great-grandma didn’t come up with the recipe totally from scratch, but I don’t know where she may have gotten the original recipe from either. I feel like I start a lot of my Snack Reports with, “I was in the grocery store and saw this on sale.” But that’s really how I end up finding most of the stuff I review. Some foodstuffs I hear about in advance and seek out to review, but a lot I find while just wandering around the grocery store, and if it’s on sale, I’m game for giving it a try. So…I was in the grocery store the other day and saw these blueberry English muffins on sale. Actually I saw a different Thomas’ product on sale first, but it’s going to be on sale for longer than these are, so I ended up getting them first. I had tried the limited edition apple pie English muffins a few months ago and enjoyed them, so I figured blueberry English muffins were worth a shot as well; I like both blueberries and English muffins.